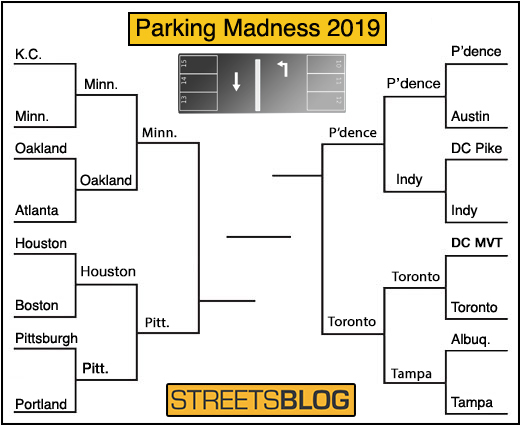 After weeks of cycling through some of America’s most impressive former parking craters, we’re down to just four cities in Parking Madness tournament comparing well-loved urban spaces across America that used to be surface parking lots. From 16 cities, we’re down to just four: Providence and Toronto and Minneapolis and Pittsburgh. A quick word about the tournament. It’s really encouraging to see how many cities around the U.S., even cities you wouldn’t expect, are seeing walkable infill development in places that were formerly just asphalt deserts. It shows every clearly the opportunity costs of surface parking lots, especially in urban areas. Now they are places for people to live, recreate, shop and work. Thanks to everyone who submitted a city spot. Schenley Plaza, a beloved park in Pittsburgh. It is a beautiful open green space with landscaped gardens, a carousel, food options and even public bathrooms. Which is such a great tradeoff from a parking lot. Pittsburghers show up for these competitions, and they’ve helped carry this space above some fierce contenders — like Houston and Portland. But is it enough to carry them to the championship? We’ll see. 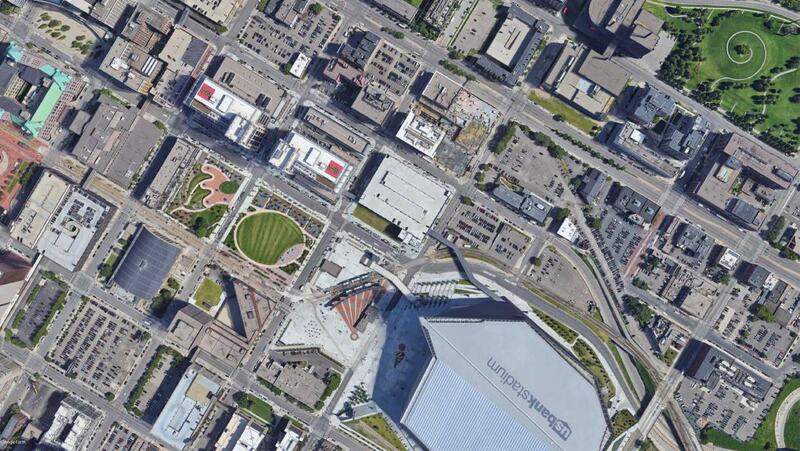 This area, Minneapolis Downtown East, was submitted by reader Alex Schieferdecker. It surged past impressive transformations in Kansas City and Oakland in earlier rounds of competition. This transformation began in 2002 and continues, as you can see in the shaded spaces that show future development. This area, by U.S. Bank Stadium, is served by both the Green and Blue light rail lines in the city, which has no doubt helped with the infill. 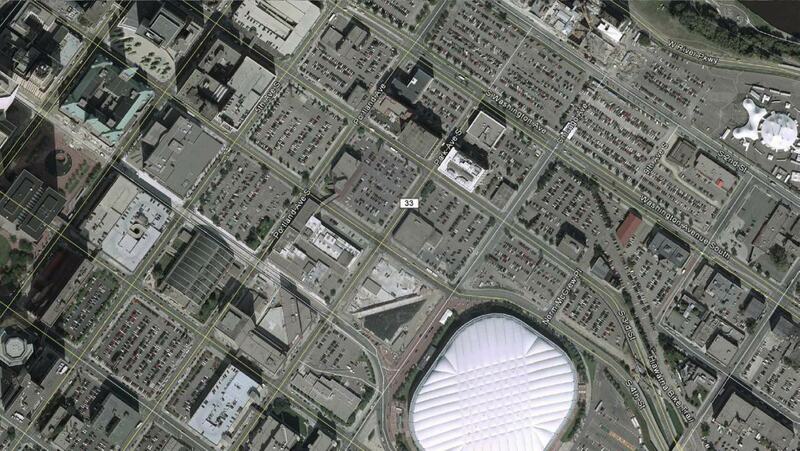 That infill also includes a park, a grocery store, new hotels, office buildings, hotels and a lot of housing. Minneapolis has been a leader in urban infill development and that’s been a key factor in helping the city reduce driving miles even as its population has soared, an impressive feat that few cities have managed. The question now is, which city deserves to go on the Championship match? How in the world is a small parking lot turning into a park somehow beating the transformation of an entire neighborhood? What criteria are people using to vote in this? Well it was actually a very large parking lot – much larger than your normal city block. 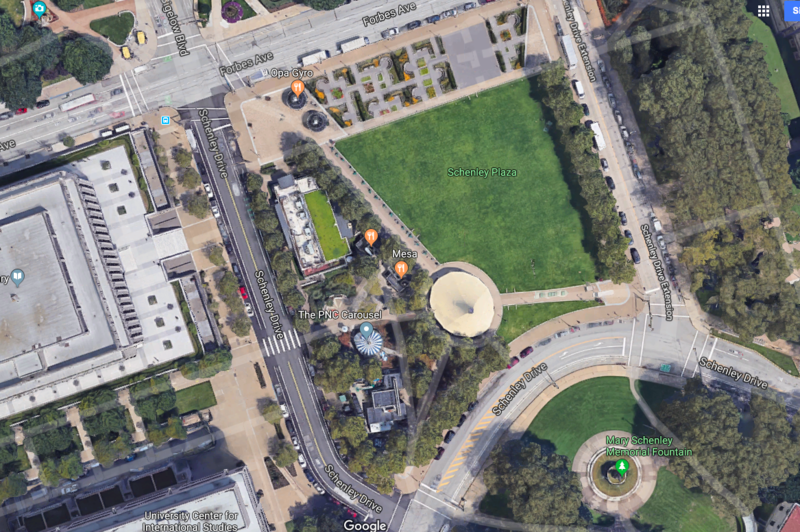 Schenley Plaza is 4.5 acres which is about 2 times the size of a normal city block and slightly larger than the Commons park that spans the two blocks shown in the Minneapolis photo. The revitalization of Schenley Plaza has also played into the transformation of the Oakland neighborhood and surrounding areas – new bike lanes all around, improved pedestrian and cycling safety measures, etc. This area of Oakland now feels much more like a large park (Schenley Plaza is at the entrance to Schenley Park – a 450 acre park) and less like the third most commuted to urban area in Pennsylvania (after downtown Phila and downtown Pgh) – much more inviting to pedestrians and cyclists. So, Pittsburghers do love Schenley Plaza, and for good reason. Pittsburgh has also been plagued with over a century of environmental woes – of land, air, and water being completely destroyed for the sake of steel production. Over the last several decades, Pittsburgh has struggled economically and with a declining population. Schenley Plaza represents a turning of the tide – a symbol that Pittsburgh is moving forward and focusing on a greener future more welcoming to the younger generation. Like Minneapolis (I’ve never been but I imagine this because of the geographic location) – Pittsburgh is a beautiful, green place that is so full of natural life. But the environment here has been destroyed. Air, land, and water has been treated like a commodity here since the mid 1800s. We’re rebuilding, trying to change the image, and trying to make this city a more livable place for younger generations. 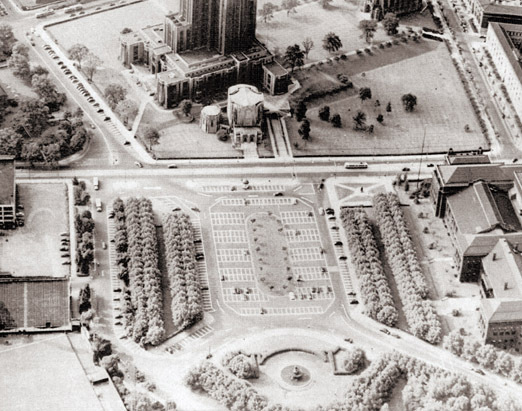 Schenley Plaza is an important part of that transformation. That is all great improvement, and I’d like to see more of it. But there are like ten of that represented in the Minneapolis example. It’s on a totally different scale. It looks pretty clear to me that this and Toronto show massive improvements beyond anything else in this tournament. Yet both are losing. Apparently, most people see it differently. I’m biased and this is hardly a real measurement system however… if there are “like ten” of these in Minneapolis, than to me, the development of green space in Minneapolis is less significant than in Pittsburgh. Pittsburgh (and surrounding western PA) is unparalleled in the environmental degradation area. Over the past 150 years, Pittsburgh has seen more environmental monstrosities than most other cities in the world. This sort of green space transformation, and actually any transformation, in a city that was dying for decades and is just now turning around, is hugely significant for this city. Perhaps that’s why so many people vote for Pittsburgh – in a city where rivers smell like sewage, creeks run orange/green/foamy, sulfur smells blanket the city every overcast morning, smog causes high rates of asthma, and steel and oil/gas companies have their name on every building, green development is a cause for massive celebration. Add to that where Pittsburgh came from – rivers on fire, soot falling from the sky, etc – Schenley Plaza is a big deal and it has been followed by similar improvements in the surrounding areas. Youre not wrong im pretty confused as well. Pittsburgh deserves final four but it is not what I expect from a winner.